Electric vehicles and renewable energy must mine more responsibly. Our new research (commissioned by Earthworks) at the Institute of Sustainable Futures found that under a 100% renewable energy scenario, demand for metals for electric vehicles and renewable energy technologies could exceed reserves for cobalt, lithium and nickel. Greater uptake of electric vehicles will translate to more mining of metals such as cobalt. The link below is to an article that takes a look at the impact of the fashion industry on the environment. The Burrup Peninsula, or Murujuga, contains over a million individual works of rock art by the Yaburara people. Scientific studies used to monitor the impact of industry on Aboriginal rock art in north west Western Australia are inadequate, potentially exposing more than a million individual artworks to damage, according to a recent paper published by myself and co-authors in the journal Rock Art Research. The rock art is located near the towns of Dampier and Karratha and is known as the Burrup Peninsula, or Murujuga. It is a priceless, irreplaceable, cultural and archaeological treasure. The peninsula is also home to industry including an iron ore export port, natural gas processing, liquefying and export facilities, an ammonia-urea fertiliser plant and most recently, an ammonium nitrate production facility for explosives. The industry and port produce thousands of tonnes of acid-forming emissions each year, permitted under environmental regulations. The impact of these emissions has been monitored through several scientific studies, which claimed there was no consistent impact on the rock art. However our paper shows that the four main studies cannot be used to monitor the impact of industry on the art due to methodological errors. For example, one study subjected rocks to acid-forming emissions and concluded that there was no consistent change in colour. But there were just not enough repeat measurements to gain any sensible conclusion about the effect of emissions on rock colour. Another experiment examining the effects of varying acid and other chemical concentrations was conducted using iron ore, which has no relevance to the rocks on which the art is situated. Measurements of colour change between 2004 and 2014 were also made on the rock art and background rock at seven different sites. But the instruments used for measuring change in rock surface colour were designed for indoor use and were inappropriate for the highly variable, hot rock surfaces of Murujuga. Typically, instruments were located at only one place on the rock surface during a measurement each year and this was insufficient to represent the highly variable rock surface. These studies form the basis for government regulation, which permits industry to release acid-forming emissions. While there is no conclusive evidence that industry emissions have damaged the rock art, recent measurements of the surface of rocks near industry by Dr Ian MacLeod, former Director of the Western Australian Maritime Museum, found acidity to have increased 1,000 times above pre-industrial levels. We showed in another scientific paper published earlier this year that acid dissolves the outer surface layer of the rocks causing them to become thinner, lighter in colour and to flake away. Once the outer surface layer is removed, the rock art is lost. The federal government is conducting a senate inquiry into the health of the Murujuga rock art, with a delayed final report due in late November. I argue that, at the very least, industry must install technology to reduce acid emissions and ammonium nitrate dust particles to virtually zero. Other rock art experts have called for a cessation of all industry on the peninsula in a recent editorial in Rock Art Research. The Murujuga rock art captures over 45,000 years of human culture, activity and spiritual beliefs through ever changing environments from when the sea was more than 100 km from its current position and through the last ice age, 20,000 years ago. The petroglyphs include some of the oldest known representations of the human face in the world. There are images of extinct mammals including megafauna, the fat-tailed kangaroo and thylacine. There are elaborate geometric designs that could have been used for navigation or an early form of mathematics. There are many depictions of hunting and cultural ceremonies as well as existing animals, birds and sea creatures. Artwork depicting a thylacine, a species which has been extinct in the Pilbarra for 3,000 years. The Murujuga inhabitants created this rock art until February 1868, when virtually the entire Yaburara indigenous population was exterminated in a massacre. Massacre of the Yaburara, only three years after European settlement in 1865, has deprived us from knowing the storylines and cultural meaning of the petroglyphs. Equally significantly, the massacre broke continuous inhabitation of the area, which has allowed successive Western Australian governments to develop in the midst of the rock art one of the largest industrial complexes in the Southern Hemisphere. Construction of the industries is estimated by archaeologists working on Murujuga to have resulted in the destruction of over 30,000 petroglyphs through removal and physical damage. Atmospheric emissions from the industries are immense. Dampier port, which is adjacent to the petroglyphs, is one of the busiest bulk-ports in the world with over 19,000 ship movements each year. These ships burn high sulphur bunker fuel, with one ship emitting as much as 5,000 tonnes of sulphur dioxide per year. The gas and fertiliser plants emit around 34,000 tonnes of acid forming compounds into the air each year. The recent starting up of the ammonium nitrate plant revealed a huge yellow-orange cloud of nitrogen dioxide with concentrations of over 1,000 parts per million. The emission of nitrogen dioxide from the plant will occur around six times each year, whenever certain industrial chemicals needed for ammonium nitrate production require replacing. These emissions are permitted under state and federal environmental regulation. Both nitrogen and sulphur dioxide react with water to form acids which are deposited on the rock surfaces. The construction of the LNG facility in 2008. The rock art at Murujuga is threatened by acid because of its unique geological properties. The natural blue-grey rock, formed from cooling magma, weathers very slowly to form a yellow coloured weathering rind, which may grow by 5 mm in 30,000 years. The yellow coloured rind is covered with a dark brown-black coating called a patina or rock varnish. The petroglyphs were formed by using hard pieces of rock to break through the patina and expose the rind. This patina is an extraordinary substance. It is formed by specialised bacteria and fungi on the rock surface, where there is seldom moisture and rock temperatures can exceed 70℃. To survive the harsh conditions, the organisms build a mineral sheath. When they die, their body and sheath combine with clay from the dust to form the hard, dark-coloured patina. Destruction of the outer patina results in disappearance of the rock art. There is evidence that the patina is flaking on some rocks with petroglyphs. The patina becomes thin and flakes away under acidic conditions. Elsewhere in the world countries have been vigilant in protecting natural and cultural heritage from acid emissions. In the US cars are banned or severely limited in many national parks because the acid formed from nitrogen dioxide, produced from vehicle exhaust, will damage the forests. In France, the 1.4 million annual visitors to the 17,000-year-old Lascaux cave paintings do not see the actual paintings, but a replica in an adjoining cave because of the damage caused by emissions from human breath. Similarly, the UK government announced in January this year they are building a £1.4 billion tunnel to remove cars form the vicinity of their 4,500-year-old heritage in Stonehenge. While removing industry may be the best solution to ensure the rock art’s safety, it may not be practical. Governments and industry must recognise their social responsibilities and ensure sufficient technology is in place to reduce acid forming emissions to near zero. 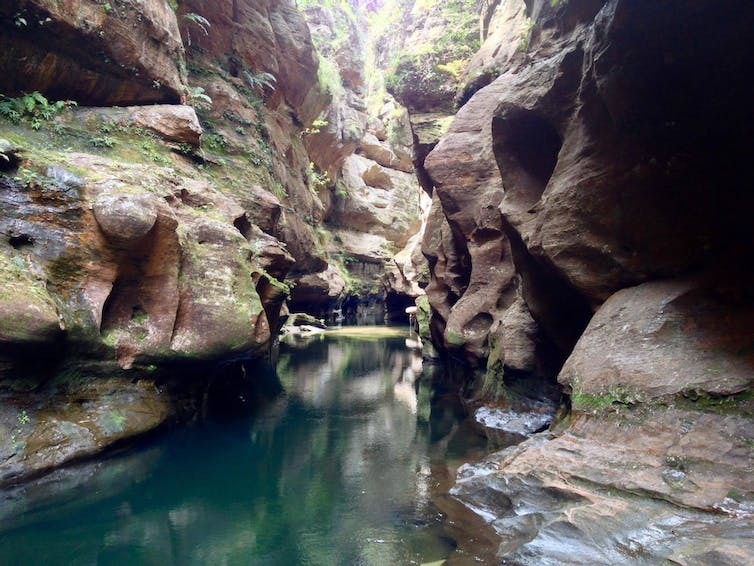 The Wollangambe River’s canyons are loved by adventurers. The Wollangambe River in New South Wales is a unique gift of nature, flowing through the stunning Wollemi National Park, wilderness areas and the World Heritage-listed Blue Mountains. It’s an adventure tourism hotspot, with thousands of people clambering through the river’s majestic canyons each year. So it was with a sense of irony that bushwalkers noticed unnatural flow and discolouration in the river and suspected it was pollution. In 2012 they contacted Western Sydney University, which has since conducted ongoing investigations. The pollution was traced back to the Clarence Colliery, owned by Centennial Coal. Our recent research confirms that this is one of the worst cases of coal mine pollution in Australia, and indeed the world. For four years I and other researchers have been investigating the pollution and its impacts on the river. The NSW Environment Protection Authority (EPA) has verified our findings. In exciting news, the mine was in March issued a revised environmental licence, which we believe is the most stringent ever issued to an Australian coal mine. This is appropriate given the conservation significance of the river and the current scale of the pollution. We are now hopeful that the pollution of the Wollangambe River may soon be stopped. The Clarence Colliery is an underground mine constructed in 1980. 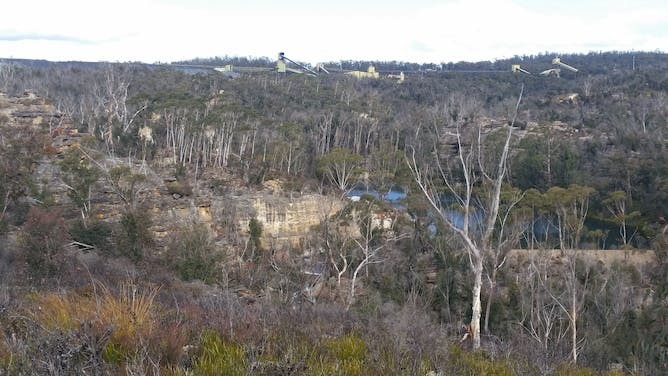 It is just a few kilometres from the boundary of the Blue Mountains National Park. Clarence Colliery and Wollangambe River. Our research revealed that waste discharges from the mine cause a plume of water pollution at least 22km long, deep within the conservation area. The mine constantly discharges groundwater, which accumulates in underground mines. The water is contaminated through the mining process. The mine wastes contributed more than 90% of the flow in the upper reaches of the river. The EPA regulates all aspects of the mining operation relating to pollution. This includes permission to discharge waste water to the Wollangambe River, provided that it is of a specified water quality. Our research found that the wastes totally modified the water chemistry of the river. Salinity increased by more than ten times below the mine. Nickel and zinc were detected at levels that are dangerous to aquatic species. We surveyed aquatic invertebrates, mostly insects, along the river and confirmed that the mine waste was devastating the river’s ecology. The abundance of invertebrates dropped by 90% and the number of species was 65% lower below the mine waste outfall than upstream and in tributary streams. Major ecological impacts were still detected 22km downstream. We shared our early research findings with the NSW EPA in 2014. The authority called for public submissions and launched an investigation using government scientists from the NSW Office of Environment and Heritage. Their study confirmed our findings. Progress was interrupted when tonnes of sediment from the mine were dislodged in 2015 after heavy rainfall and the miner and the EPA focused on cleaning the sediment from the river. This incident has resulted in the EPA launching a prosecution in the NSW Land and Environment Court. We recently compared the nature and scale of pollution from this mine with other coal mine pollution studies. The comparison confirms that this is one of the most damaging cases of coal mine water pollution in Australia, or internationally. Even 22km below the waste outfall, the Wollangambe is still heavily polluted and its ecosystems are still degraded. One of the unique factors is that this mine is located in an otherwise near-pristine area of very high conservation value. The new EPA licence was issued March 1, 2017. 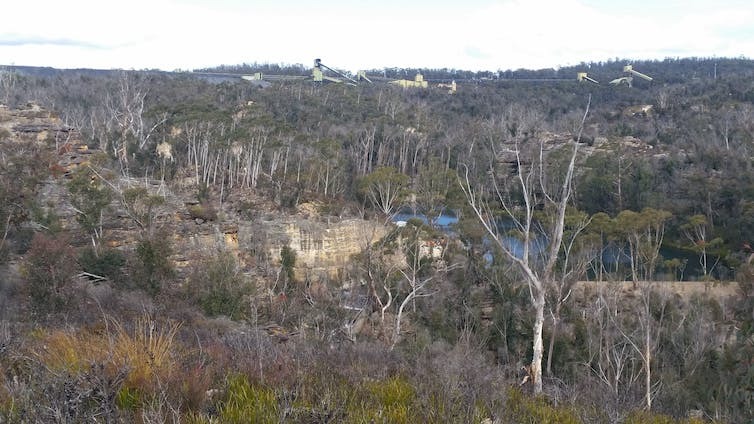 It imposes very tight limits on an extensive suite of pollutant concentrations that the mine is permitted to discharge to the Wollangambe River. The licence covers two of the most dangerous pollutants in the river: nickel and zinc. Nickel was not included in the former licence. The new licence now includes a sampling point on the river where it flows into the World Heritage area, about 1km downstream from the mine. The licence specifies vastly lower concentrations of pollutants at this new sampling point. For example, the permitted concentration of zinc has been reduced from 1,500 micrograms per litre in the waste discharge, in the old licence, to 8 micrograms per litre. It can be demoralising to witness growing pollution that is damaging the ecosystems with which we share our planet. This case study promises something different. The actions of the EPA in issuing a new licence to the mine provide hope that the river might have a happy ending to this sad case study. The new licence comes into effect on June 5, 2017. Our current data suggest that water quality in the river is already improving. We dream that improved water quality, following this licence, will trigger a profoundly important ecological recovery. Now we just have to wait and see whether the mine can improve its waste treatment to meet the new standards. Following a campaign by the coal industry, Prime Minister Malcolm Turnbull has argued for new coal-fired power stations in Australia. But these plants would be more expensive than renewables and carry a huge liability through the carbon emissions they produce. Major Australian energy companies have ruled out building new coal plants. The Australian Energy Council sees them as “uninvestable”. Banks and investment funds would not touch them with a barge pole. Only government subsidies could do it. It may seem absurd to spend large amounts of taxpayers’ money on last century’s technology that will be more costly than renewable power and would lock Australia into a high-carbon trajectory. But the government is raising the possibility of government funding for new coal plants, with statements by Deputy Prime Minister Barnaby Joyce, Treasurer Scott Morrison and Environment and Energy Minister Josh Frydenberg. The suggestion is to use funding from the Clean Energy Finance Corporation. For this to happen, presumably the CEFC’s investment mandate would need to be changed, or the meaning of “low-emissions technologies” interpreted in a radical way. It should come to nothing, if minimum standards of sensible policy prevailed. But an ill wind is blowing in Australia’s energy and climate policy debate. The situation in parliament is difficult, and the Trump presidency is giving the right wing in the Coalition a boost. Proponents of new coal plants call them “clean coal”. They have appropriated a term that normally means burning coal in power stations with carbon capture and storage, a technology that filters out most of the carbon dioxide. But this is expensive and has made little progress. Turnbull and others are simply suggesting Australia build the latest generation of conventional coal-burning plants. They are not clean – merely marginally less polluting than the old plants running now. A new high-efficiency coal plant run on black coal would produce about 80% of the emissions of an equivalent old plant. An ultra-supercritical coal plant running on black coal emits about 0.7 tonnes of CO₂ per megawatt hour of electricity, or about 0.85 tonnes using brown coal. That is anything but clean. For comparison, typical old “dirty” black coal plants in operation now emit around 0.9 tonnes, so the improvement from replacing them with the latest technology is not large. Gas plants produce between 0.4-0.6 tonnes, much less than the suggested new coal plants. Gas has the added benefit of being able to respond flexibly to demand. A plant with carbon capture and storage might emit around 0.05 tonnes, and renewables zero. The Australian grid average right now is around 0.8 tonnes and gradually falling. New coal would tend to keep that average higher over the long term. A single typically sized new coal plant could blow out in the order of 5 million tonnes of CO₂ each year – about 1% of Australia’s current annual emissions – and would have an expected lifetime of 40-60 years. It would also pollute the air locally, as all coal plants do, causing damage to people’s health. If we wanted to make up for the extra coal emissions by doing more in industry, transport or agriculture, then this would come at a cost in those parts of the economy. In-depth research has shown that decarbonisation of Australia’s economy needs to have zero-carbon electricity supply at its core. What if we don’t care about the climate? Building coal power plants is expensive. The average lifetime cost of producing power with ultra-super critical plants in Australia is estimated at around A$80 per megawatt-hour. This assumes financing is available at standard interest rates and that the plant runs at high capacity. Given the risk that the plants will be liable under stricter carbon limits in the future, the financing costs are bound to be higher, probably north of A$100 – and may be as much as A$160. If the plant is not fully utilised, as is already the case for existing coal plants, average costs will be even higher. By comparison, wind farms now get built at an average cost of A$75 per megawatt-hour, and solar parks at around A$110. Both are expected to come down to perhaps A$50 by 2025. New coal plants take many years to prepare and build, so 2025 is the relevant comparison. In fact, the overall comparison costs for renewables are even lower. This is because wind and solar built in 2025 would be replaced in the 2050s with even cheaper systems. There are extra costs associated with wind and solar – for instance, through pumped-hydro storage or more gas-fired power plants to balance supply. But these costs are far less than the underlying cost of renewables. So renewables including system integration costs will be cheaper than new coal plants, perhaps by quite a margin. Let’s say, very conservatively, that renewables are A$20 per megawatt-hour cheaper. For the coal plant that’d be an extra cost of A$150 million per year, or A$6 billion over 40 years. The extra cost could be much higher if the plant was retired before the 2060s or not run at full capacity. The subsidy required would be potentially billions of dollars for each plant. That’s billions of dollars from the taxpayer or electricity user, in order to supply power with high carbon emissions that are then locked in for half a century. It should not happen in a country that prides itself on rational economic policy. Instead, government should set its sights on the long-term economic opportunities for Australia in a low-carbon world, and chart a path for the transition of the energy system. Turnbull referred to Australia’s position as a coal exporter. But a revolution is under way in energy technologies. While coal will continue to be used in existing plants, the times of growing coal use are over. Already more than 70% of the world’s annual power sector investment goes to renewables. Australia is lucky in that there are no limits to the amount of renewable energy that could be produced. New industries can be built around it. We should invest in the industries of the future, not sink more money into the technologies of last century.